Researchers from the Centre for Anatomy and Human Identification at the University of Dundee have discovered that 17 bodies thrown head first into a Norwich well in the 12th or 13th century were Jews, at least five of them from the same family. The remains were first discovered in 2004 during the construction of a shopping center. The archaeological survey of the area had been completed months earlier when archaeologist Giles Emery of Norvic Archaeology got a call from one of the backhoe operators saying he’d seen a skull in a foundation hole over 16 feet below ground level, far deeper than normal burials even from the ancient layers. Emery returned to the site and when the machine pushed aside a clump of dirt, they saw a tight mass of human skeletons which had been dumped into the well. They were shoved in so close together that at first Emery thought there were three or four bodies. It was only after further excavation that he realized there were so many more. Eleven of the 17 bodies were children between the ages of two and 15, five of them below the age of five. The positions in which they were found indicated many of them had been dropped into the well from their ankles, the adults first. There was no obvious cause of death detected in the initial osteological examination, although some of the bones did show signs of malnutrition and non-fatal trauma like healed minor fractures and arthritis. Radiocarbon testing and some pottery sherds found in the well dated the bodies to the 12th or 13th centuries. It was a mysterious, unique find. No other pile of bodies shoved into a well has ever been found in the UK. There was a consecrated cemetery within view of the well and the Jewish neighborhood a few steps away, so why had these people been thrown away like trash instead of buried according to religious custom? Even common graves and plague pits are at least holes in the ground. Recently the BBC program History Cold Case became involved, bringing the University of Dundee team on board to perform cutting edge forensic examinations of the bones. They were able to eliminate disease as a cause of death. Bubonic plague was still a hundred years away at the time of death, and there was no evidence of any other fatal illness like leprosy or tuberculosis in the bones. It was DNA expert Dr. Ian Barnes who found the smoking gun: five of the individuals had retrievable, testable DNA and it indicated that they were Jewish. The mitochondrial DNA — DNA that remains the same transmitted down the female line — of all five people matched, so they were family members. Stable isotope analysis, which uses the trace elements found in the bones to determine diet and migration patterns during their lifetime, indicated that the skeletons were from the Norwich area. Norwich had a well-established Jewish community from 1135 until King Edward I expelled all the Jews from England in 1290. That’s not to say they were embraced as fellow men and brothers. When 150 Jews were killed in York in 1190, Norwich followed suit with a massacre of its own. Only the Jews who had fled to the castle survived. In the 1230s, there were a number of Jews executed because of a rumored child abduction, your classic blood libel. Here’s a striking view of how Jews were seen not just by the population of Norwich but by the government, which had no problem at all borrowing money from Jews while also taxing them at sky-high rates and stealing/confiscating their property. It’s a drawing found on an Exchequer Roll, a document that lists tax payments made by the Jews of Norwich in 1233, during the reign of King Henry III. That three-headed monster with the crown towering over the center of the drawing is Isaac fil Jurnet, a wealthy Jewish moneylender from Norwich who was banker to King Henry, the Abbot and monks of Westminster, the Bishop of Norwich and many, many other movers and shakers. The man and woman facing each other beneath him with Satan between them are Mosse Mokke and his wife Abigail both of whom were employed as debt collectors by Isaac. On the left there’s a poor Christian monk, his scales full of coin that Isaac is trying to wrest from him using one of the many devils at his command. Isaac had sued the Westminster monks to get the interest from money they had borrowed after they refused to pay it. That’s the level of anti-Semitism found in the tax rolls of 13th century England. You can imagine how much worse it got outside official government documents. Bad enough, certainly, to explain 17 people, 11 of them children, murdered and stuffed in a well. This entry was posted on Thursday, June 23rd, 2011 at 11:52 PM	and is filed under Medieval. You can follow any responses to this entry through the RSS 2.0 feed. You can skip to the end and leave a response. Pinging is currently not allowed. How do you tell from the DNA of an unknown person of the 12th/13th century that they were a Jew? Presumably these unfortunate people don’t have known living relatives whose religion can be checked. Different ethnic groups have different haplotypes on their Y-DNA (for paternal ancestors) and on their mitochondrial DNA (for the maternal line), so you can use DNA to identify your ethnic heritage. It’s quite the geneological trend nowadays. Why throw them down a well? Surely it would poison the well and make it useless, wells were a precious resource in medieval times. I assume they must have drowned as they don’t seem to have been killed and then thrown down the well. Could this also have been a punishment aimed at the rest of the entire Jewish community in the area, as there was Jewish neighbourhood a few steps away and it was probably their community well. I’m also thinking it might have been a convenient way for the culprits to rationalizing they didn’t actually murder these people, a bit like the medieval practice of witch dunking, telling themselves that if god wanted them to survive they wouldn’t have drowned. What a sad horrific story. I was wondering if they were put in the well because the water went bad and the neighboring Jews were blamed for it. The notion that Jews poisoned wells to spread disease was a common anti-Semitic slander. Wow! As you say, “Jews poisoning wells” is an old topos. So is “throwing Jews in wells” (although the ultimate source would seem to be Joseph and his brothers…and then there is “Borat”! )Questions, theories and maybe even answers will be emerging from the Norwich case for years to come. Beginning with the question that you already asked, “Why THAT particular well?” It is difficult to imagine that a functioning well would be put out of operation with bodies, unless there was a back story. I note from the source article that the remains were put “in storage” after 2004. And presumably the shopping center went up as planned and no trace of the well was left on/in the ground. It could easily have become an iconic Jewish site. It is fascinating to me to read all of the speculation surrounding finds like this. I suppose we want to ascribe motivies to these horrible scenes to try and explain why they ever ocurred. I can only wonder what the conclusions might be if the skeletons were found to be of some other origin. I note from the source article that the remains were put “in storage” after 2004. And presumably the shopping center went up as planned and no trace of the well was left on/in the ground. It could easily have become an iconic Jewish site. True that. You’d think there would be legal provisions to stop construction if an unusual and significant archaeological site is discovered, even when the survey returned nothing. Surveys don’t usually dig down 16 feet, but building foundations do. Instead all we have are pictures documenting the find in situ. What I wonder is, were they thrown in dead or alive? I know we can’t tell that, at least I don’t think. You can definitely tell from DNA whether they are Jewish, especially because it was so rare for Jews to marry outside the faith. That only really started happening later, for example, my family married into Christian roots – otherwise, I would have been raised Jewish. Makes me wonder what exactly my medieval ancestors went through – they were in central Germany where a lot of Jewish persecution occurred. I do not believe they were talking about Jews as people of a type of religion, but as an ethnic group. I want these people to be flown to Israel for burial. I want them buried with a full Jewish funeral and the respect that they deserve with their people. Not in some pathetic memorial in Norwich which can be vandalized by thugs. Sadly attitudes haven’t changed much in the thousand or so years since this happened. Britain today is not a suitable environment to remember these poor poor people. Bring them home now! Ah yes, the “stop hitting yourself!” theory. Clearly the most likely explanation is that those toddlers slit their own throats and dropped themselves down the well onto the bodies of their parents. Or that a rabbi did all the slicing and dropping and then climbed down to the bottom of the pile of children to make it look like they did it. Fiendishly clever as always, donchaknow. I don’t think we can either. There are any number of ways they might have died, and without being able to pinpoint the cause of death, we’re probably not going to be able to tell whether the well was an element in the murders or just the receptacle of them. As of 2008, law in the UK requires that all human remains discovered, even of archaeological age, be reburied promptly. I don’t know what the next step is — exemptions can be granted for important research — but they can’t be reburied where they found them since there’s a mall there now. I’ll see if I can find out if there are any plans for respectful burial. Turn over a rock and you never know what might crawl out – especially when it comes to genteel British antisemitism. That is exactly why the remains should NOT be sent be sent to Israel. Many thousands of Jews live (and are buried in Great Britain), so the Norwich Seventeen needn’t be exported in order to be with “their people”. I think at least in part the delay is attributable to the fragmented system of freelance archaeologists hired by construction firms and real estate developers to survey sites before building. It’s not a government agency doing the work or even keeping tabs on the people doing the work. In this case it was just Giles Emery and a small team of colleagues, and they have to work new projects to make a living so they probably have nothing like the time and resources to focus on a single discovery, even one as remarkable as this. 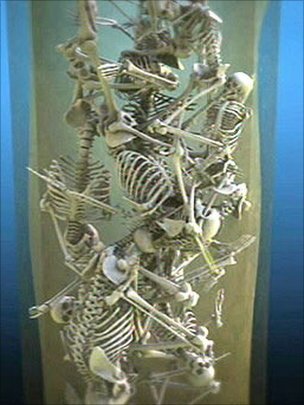 If the television show hadn’t come through with their funding-and-expertise-ex-machine, I fear those skeletons would still be in storage. I read an interview with Emery on an Italian archaeology blog done after the show had stepped up but before the researchers completed the study. He doesn’t explain the delay, but I get the impression he is genuinely haunted by the fate of these 17 people and relieved someone can do for them what he was unable to do himself. Archeologists – as you say – are often caught in the middle. And in cases like this, the employers are usually hoping against hope that nothing will be found, so that they can get on with their plans for development. HOWEVER,considering the history of Norwich and the fact that this well was only a few steps from a Jewish neighborhood, light bulbs must have flashed on over lots of heads back in 2004. Then…just maybe?…the light bulbs were switched off again… If anyone had whispered the “J-word” to the press or to a long list of foundations and private funders, research money would have appeared over night! I suspect that we will be following this story for quite a long time. The dust (metaphorically speaking)is yet to settle on the African Burial Ground in Lower Manhattan! Very interesting. Thank you for the reporting and all the following comments. I have been rolling this round in my head since watching the programme on Thursday 14th July. I have now seen it twice as I recorded it just so that I can get the facts straight in my mind. As a native of Norwich and someone who is very proud of our City and our historical past I am really appalled at this discovery. Yes I am appalled that it took place at all but even more appalled that we have only just got to hear about it, why was it kept secret? The Chaplefield Shopping Centre has been opened for quite sometime now and is classed by the Norwich City Council as a must visit attraction so out of respect or human decency would you not think there could at least be a plaque to recognise such a tragic event. The thing I find strange is that something as traumatic as this was not recorded or even passed on through the generations, which makes me wonder if these unfortunate people disappeared overnight and were the victims of thugs. But then one of the experts did wonder if they had had their throats cut first but even then to slaughter 17 people would be quite difficult without some of them reacting violently so I think that theory can be ruled out. In the programme they did conclude that the well was dry or had very little water as some of the adults had fractured skulls but unless the well was filled in with soil someone must have noticed the smell of decaying bodies so the local community must have known or been involved. I just can’t begin to imagine how a community could live and carry on with that knowledge. Also lets not forget the Vikings often wiped out british villages including all women and children so sadly in historical terms human slaughter of innocents is nothing new. Human beings continue throughout history to be tribal. these were also the times of the Crusades when it would be odd for the Establishment to help a community that the country was at war with. I hope that they do DNA on ALL the remains. One of the first to be tested was NOT Jewish. I think we have a scenario where there was a riot and anyone involved was put down the well as a coverup. They could then just tell the rest of the Jewish community that they had left. The Jewish historian said that the Sheriff had lost control: he probably wouldn’t bother to find out. Remember also that dead cats were found. These people believed that Jews were witches and cats were their familiars. As to the smell. This would not have been a problem. This area was for tanning etc. With no sanitation either I don’t think anyone would have noticed. It is a very haunting story. I would really hope that all the Jewish people are buried with the proper rites as well as any Christians. Not because I am religious but because this is what they would have wanted and some people were deliberately trying to prevent. Trawling through a number of websites, what I find lacking is any mention that the blood libel was invented in Norwich. The BBC program did point out that some of the Jews were wealthy, and acted as royal moneylenders,but this group showed dietary deficiencies inconsistent with a prosperous lifestyle. So, a motive of jealousy was offered as possible incentive, but the facts clearly oppose this hypothesis for the Jews discovered in Norwich. Also not mentioned was that the “relics” of a martyred child proved to be a popular religious attraction in medieval England. Norwich was the first, but not the last city to have a martyr which drew crowds and brought trade to the city. Sad that this story was robbed of its true historical context. You’re referring to William of Norwich, I think. His death was the first known Medieval instance of a Christian child’s death being blamed on Jewish ritual murder, but the blood libel is far older than that. There are references to Jews ritually murdering Christians in ancient sources. European Jewish history of the 1100s is soaked with blood. Please read John McCullogh and Langmuir. There were repeated, violent attacks on Jewish communities all over England in the decades after William of Norwich in 1144. The Coronation of Richard III was attended by a bloody pogrom. “the history blog” is nonesuch, there is a very big part of the picture missing here, namely: brutal and organized violence against Jews in England from mid-1100s until their expulsion in 1290. Jews owned most English debt, defied Christian religious sensibilities, and were the nobility’s convenient scapegaot for many societal ills. As for the well forensics, maybe they had their throats cut first. Jewish history is just a series of holocausts. If the 1200s English had trains, radios, machine guns, and Zyklon B, they would have systematically exterminated their Jews. Therefore, Britain should pony up support for the Jewish State, which keeps us Kikes out of English wells. I think I went into some detail, actually, on how entrenched anti-semitic ideas and violence were in 12th and 13th century England. I disagree that Jewish history is “just a series of holocausts,” however. It is far more than that, and I find it bizarre that in the course of advocating Jewish nationalism you feel the need to reduce the rich and vibrant history of Jews in Europe in so dismissive a manner, as if all they ever did was get slaughtered. I whole heartedly agree about a simple plaque being placed in the shopping mall in Norwich (where I also live )what could be done to make this possible ? I’ve just watched the documentary on YouTube and I’m not sure why everyone believes the bodies were Jewish. The DNA expert said that the sequences occur in 6% of the population of Europe, but 30% among Ashkenazi Jews. If the population of Norwich at the time was 12,000, then this implies that there were 720 Christians with those genetic markers against about 50 Jews (since there were roughly 150 Jews in the town). The programme falls for a classic case of the ‘Prosecutor’s Fallacy’! I’d also point out that there can’t have been a pogrom on the coronation of Richard III since there were no Jews in England at the time. The shopping centre in question has been built ,Although I am not Jewish I respect their and indeed other religious beliefs,I would be interested in having a plaque errected if this programme has hit on the truth and that they are in fact Jewish. in the program it states that some adults had injuries from being crushed, landing on a hard surface suggesting the well was dry at the time. Not for argumentation’s sake, but the Joseph account in Genesis refers to a pit (bor) as opposed to a well (be’er) and specifies that the pit contained no water. This is a link the a Google+ account related to the above, which has links and info. The burial of these bones is also featured. The JEWS should count their blessings that they weren’t American Indian. This Jew once taught American Indians (Navajo). Their story is remarkably similar to ours: driven into exile, abused, and ultimately able to return to the homeland and flourish. Plenty of blessings to count on both sides. Someone needs to get this known to the pubic and get everyone to sign a pertesion to get the a sign put up in respect for these poor people. And then take it up to norwich city council and get the sign put up. Norwich are normaly keen to share thir history. Why not this? If they refuse take to the papers. So disrepectful that they was put in stoarge like they was hideing the find.they should give the famliy a respectfull burial and use it for a jewises funraiseing day,for ill famliys so some good can come from this. Sorry about my spelling. But I hope u get the point. It was Richard the first s coronation during which the pogrom occurred.Not of course during Richard the third’s coronation. Uniparental DNA markers (Y-chromosome and mitochondrial DNA) usually aren’t specific enough by themselves to assign individuals to ethnic groups. For example, Y-chromosome haplogroup J, the most common haplogroup among Jews, is also found throughout European populations at lower percentages. The problem is even worse with mitochondrial DNA haplogroups. High-resolution haplotype analysis can sometimes resolve this, or discovery of a fairly unique Y-chromosome signature like the so-called “Cohen Modal Haplotype.” Perhaps that was done although the BBC Cold Case show didn’t make that clear. The other weakness of uniparental markers is that they don’t give a good sense of overall genomic ancestry since they represent such a small part of it. We can see this now that analysis of autosomal DNA at hundreds of thousands of points in the genome has become possible. For Ashkenazi Jews, the distribution of Y-chromosome haplogroups appears more Middle Eastern than the autosomal DNA, which is suggestive of significant Southern European admixture, probably during ancient times before the rise of Christianity ended Jewish proselytism. For the truly interested (not that anyone will ever read this 2+ years after the original post), papers by D. Behar et al. and G. Atzmon et al. describe some of the more recent research and may be open access by now. The majority of Natives died of starvation and disease; not murder and mayhem. yes John, I do agree with you ,I hadnt thought that ,it may indeed have been the consequence . there is a comment just been uploaded ,and the possibility of disease and or starvation seems to be a theory of Johns ,and knowing the appalling living conditions at this and indeed other times throughout Englands history, I can quite beleive that this may have been the case with regards to these 17 folk,even so I would love to see a plague erected in Chapelfield. These claims that the bodies in the well are ‘Jewish’ is only based on a shameful misuse of archaeological and scientific evidence, based on cynically invoking racist stereo-types, in order to get sensationalist TV publicity. The survey of the bones was very limited and no conclusive archaeological evidence of any sort was found and there was not a shred of documentary evidence to be found n support either. The evidence does not stand-up to any type of logical scrutiny by any qualified person and does not prove the flimsy story-line based on racist stereotypes into which they wished to shoe-horn the evidence. The Chief Rabbi’s Office also examined the ‘evidence’ as they have a responsibility to protect Jewish remains and found it to be entirely lacking; otherwise the remains would have been required for immediate Jewish reburial. This is in fact more a matter for a complaint to the ethics committees of the universities to which the ‘Cold Case’ team members are connected and has done much to set back valuable work over the last decade to represent medieval Anglo-Jewish history in an objective and accurate setting, as it takes us back to the antiquated ‘murder and mayhem’ view of Jewish history and is irresponsible in the way they have played up to prejudices. Yet, several hundred of them controlled 30% of all the coin circulation in England. They also had a monetary monopoly. And for God’s sake, more English died during Norse raids, yet it’s the Jews that get all the press about their poor anti-Semitism. Yes Shooter you are quite right ,all very unjust .In this crazy world events happening now are dreadful and so very sad ,that innocent people die because of lack of intelligence and feeling for others beleifs ,where will it end and will it ever end ??? ?